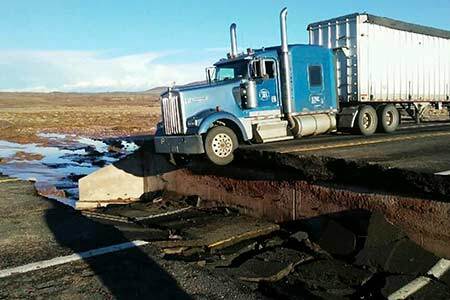 Cameron, Arizona—A 26-year-old woman from France died as the result of an accident when a pickup truck hit a stretch of highway collapsed by heavy rains and flooding near the town of Cameron, causing the driver to lose control and slam into her vehicle on Wednesday night. The unidentified woman was traveling northbound on SR-89 and had just crossed over a section of the highway as it started to give way. She steered her car to safety, then stopped and got out of her vehicle. A 40-year-old man from Lakeside traveling behind her vehicle made it across the sunken area, but lost control of his pickup truck and struck the woman as she stood beside her car. She died at the scene. The Arizona Department of Public Safety was called to the scene near Cameron on SR-89 at milepost 471 at about 11:37 p.m. The woman’s two passengers were treated for their injuries at a nearby hospital and released. The pickup truck driver and his passenger were treated for minor injuries at the scene. Debris from the crash and damage to roadways from heavy rains led to the closure of lanes in both directions at the junction of SR-89 and SR-160. We extend our condolences to the victim’s family and friends at this time of great loss for them.